Craisins, Raisins, Cinnamon, Nutmeg & Brown Sugar added! Thanksgiving was GREAT! The long weekend was packed with chatting it up with the family! As usual, earlier, there were the traditional foods to prepare, but this year a tad little less time for baking. So glad that I had planned to bake Craisin Raisin Apple Crisp after the Butternut Squash Custard Pie came out of the oven. There are times when an easy tasty dessert made with sliced fruit tastes just absolutely delicious! It was one of those times! As you know, I m not much into purchasing baked goods and I try to keep the sugar to flour ratio low when baking. 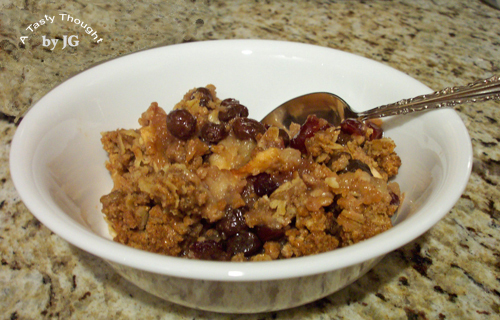 In Apple Crisp no pie crust needs to be rolled out. 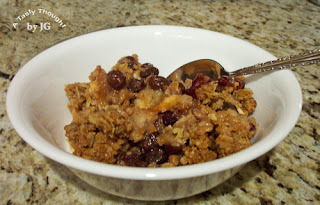 Raisins & Craisins are mixed in with the apples before baking. The oat topping is spread over the top of the thinly sliced apples. It's easy to prepare and it tastes wonderful! We all agreed, the NUTMEG added into the crumb mixture tasted divine! My younger son has put in his request for this dessert the next time he stops in. Now, after baking the Butternut Squash Custard Pie, there was extra unbaked pie crust. Tasty Treats are the anticipated dessert whenever I roll out pie crust. After making these for so many years, they have become the Part 2 when baking a pie. Any remaining extra dough is formed into a ball and rolled out. Brown Sugar, Cinnamon, Nutmeg, Craisins & Raisins are scattered over the top of the dough. 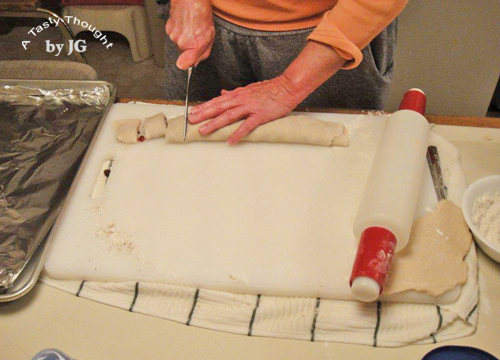 Then, starting at one end, the dough is rolled into a log and lightly pressed. Next, cut the log into slices. Onto a foil lined baking sheet the slices are placed - a 350° F oven for about 20-22 Minutes or until slightly browned. The Tasty Treats are a wonderful way to use leftover dough. And such a treat - little rolls of fruit and flaky baked dough. It's always part of baking a pie.﻿ It sure does not taste like a "leftover"! Do you also bake these? What does your family call them? We enjoyed the holiday weekend! 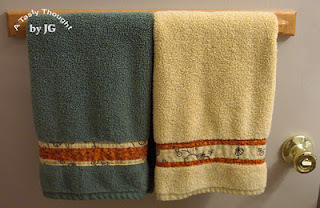 The Guest Towels are Ready! ﻿Every year just before Thanksgiving when Ocean Spray Cranberry Sauce is a featured special at my grocery store I purchase both the jellied and the whole berry sauces. There are some Thanksgiving Day traditions that I savor from my own childhood. One tradition is placing a tangy slice of this cold jellied sauce next to steaming turkey slices and mashed potatoes (that are topped with yummy gravy) on my dinner plate. 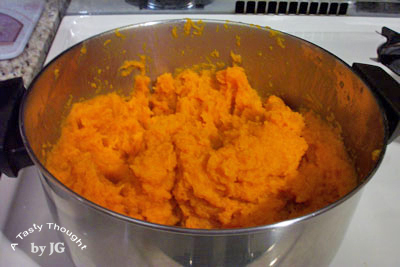 Oh, definitely, mashed Butternut Squash is also present. That was also a tradition of my DH's family. Yes, I could prep the whole berry sauce earlier during Thanksgiving week and we could enjoy that, but it would not be the same as both of our childhood memories. This tradition has continued. Our sons have always kept a watch for the can of Cranberry Sauce while grazing in the fridge before dinner. This treat is enjoyed with our Thanksgiving Day Dinner, enjoyed the next day with Hot Turkey Sandwiches and then enjoyed once again with Turkey a la King that is served over toasted Oatmeal Bread. There is always enough roasted turkey remaining for that last meal. Turkey a la King is delicious and it's very easy to prepare. This meal always uses the remaining pieces of roasted Turkey and we always remember the Cranberry Sauce! Maybe there will be a few slices of Cranberry Bread (click on name) to enjoy later for dessert. In New England we do like Cranberry Bread. 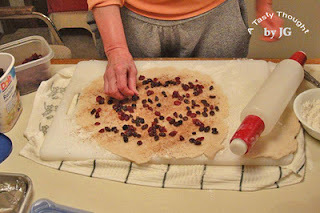 :) Two of these breads filled with fresh chopped cranberries are on my "to bake" list for tomorrow along with Butternut Squash Custard Pie (click on name). Enjoy the holiday with your family & friends. We have much to be thankful for and it is always good to appreciate what we have. Sausage Soup Simmering - Mmm! ﻿This afternoon a steady rain is falling. It's the perfect kind of day to enjoy a large bowl of hot hearty colorful soup filled with veggies at dinner. Tonight, it's Sausage Soup for us. Two days ago my large Revereware covered pot was put to use. 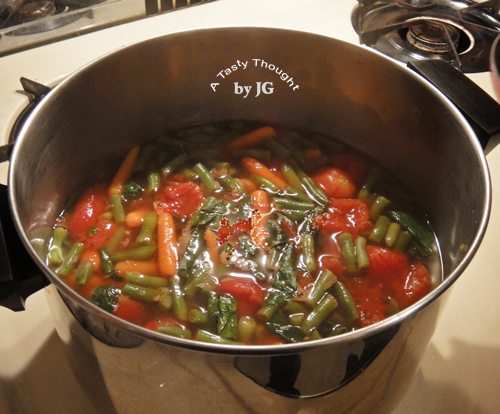 A batch of this delicious soup simmered along. We sure did enjoy it for dinner that evening! After our evening meal and the soup had cooled four labelled portions were placed in Ziploc Freezer containers and two portions were saved to enjoy again a bit later in the week. It's just the best to have a hearty soup ready to defrost waiting in the freezer! Yes, Bertucci's does offer this soup on its menu, but I find their soup consists mostly of broth. Nothing beats a hearty Sausage Soup. And the cook controls the salt content! Now, whenever I make this, I add about 12 oz. of defrosted Green Beans. Green Beans are a fave in my fam, so I add them in whenever and in whatever meal I can. *Extra portions can be placed in the fridge or stored in the freezer. This makes one delicious meal on a very busy evening. It's always a welcome sight to find a container in my freezer. *When reheating, a 14.5 oz. can of College Inn Light & Fat Free Chicken Broth is added to the defrosted contents while the soup reheats on my stove. The Rice has absorbed the liquid. *Update: Our neighborhood is lookin' good after this welcome sight yesterday! ﻿﻿Sausage Soup makes a very tasty meal on a very busy night, like tonight! Do you also Enjoy it?! One of my Thanksgiving traditions is baking Butternut Squash Bread. In November while I am prepping the delicious orange Butternut Squash to store in our large freezer, I save 2 cups of the mashed veggie to bake 2 breads for my fam to enjoy during the Thanksgiving Day weekend. 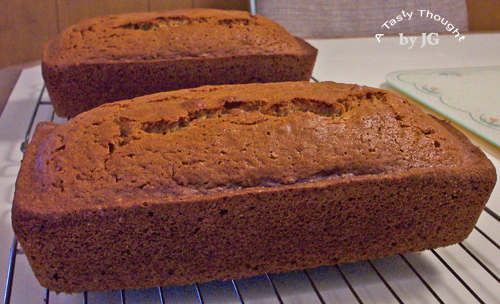 Within 2 days after "saving" the orange veggie, I bake 2 breads. After they are cooled, they are wrapped in Heavy Duty Reynolds Wrap, labelled & stored in our freezer. This is a baking tidbit that my sister & I learned from our mom. She did not use canned pumpkin nor steamed pumpkin, she always liked the flavor of Butternut Squash for this quick bread. Now, the tradition lives on. Yes, canned pumpkin can be substituted. In my usual reduce the cholesterol content while baking, I use 6 Egg Whites and 1 Whole Egg for the 2 breads that this recipe yields. I also now use Olive Oil for baking & sauteing rather than Vegetable Oil. My recipe card for Butternut Squash Bread is available for this delicious moisty bread by clicking here and printing. This recipe yields 2 breads. It freezes very well! This recipe can be cut in half to bake 1 bread. *If baking 1 bread, use 1 Whole Egg + 2 Egg Whites or 2 Whole Eggs. This week while I am prepping the Butternuts, I will also do a little baking for the upcoming holiday. My family has much to be thankful for this Thanksgiving! Oh, it was not an easy find the end of September. Butternut Squash! The orange colored tasty fall vegetable had a difficult growing season in some areas of Western MA this summer. The heavy rains at the end of summer in my area were not beneficial to this vegetable. 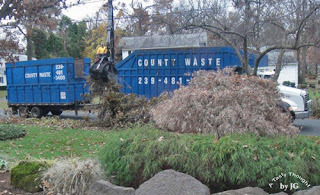 Usually, I purchase a large quantity at Meadowbrook Farm in East Longmeadow, but it was not in the cards this year. So, my DH & I took a "road trip" up to Atkins Farms in Amherst. Growing up in Amherst I remember when this venue was a small roadside stand. Now, customers from that area shop year round in Atkins' large market in addition to having the opportunity to pick apples in designated orchards during the autumn harvest season. Our purchased stash of Butternuts from Atkins has been stored in our garage. This fall has been hectic and I just never did get "round tuit" and prep them for our freezer. Well Thank Goodness For That! Any food in our fridge and large freezer was tossed during our long lived power outage. Sitting on our garage floor are the untouched beauties that we purchased about 1 month ago. Oh, yes! As we are catching up on things, the Butternut Squash is on the top of the list! ﻿After adding cold water (to reach up about 2" in the pots), the heat is turned up to High. After a Boil is reached, lower the heat and simmer about 13 - 15 minutes, until pieces can be pierced with a fork. 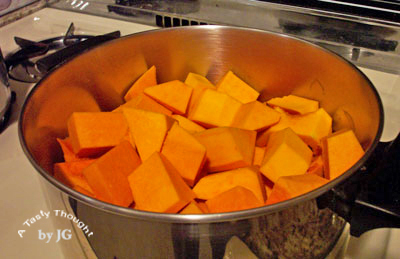 During the cooking minutes, carefully stir the Squash pieces in the pot, so they soften equally. After draining the squash using a colander, return the chunks to the large pots and mash. 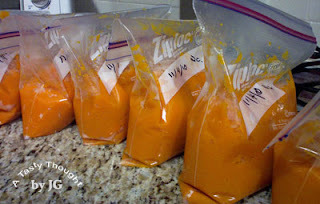 I pack about 2 Cups of mashed Squash in Ziploc Freezer Bags. After labeling, store in freezer. Whenever desired for dinner a bag is unwrapped and the frozen chunk of squash is placed in a Corning Ware container with a lid. Reheat in the microwave. There is no need to add any sugar nor butter/margarine. This is a very tasty veggie and stands quite well on its own! ﻿﻿There will be Butternut Squash on our Thanksgiving Dinner table served in a number of recipes. Soon, Ziploc Freezer bags will be located in our freezer containing this very delicious orange colored family favorite veggie. Life is good! Do you like the taste of Butternut Squash also? So much has been accomplished this week. And ... it's only Wednesday! 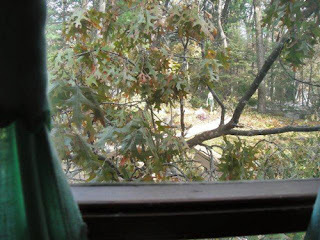 Today, as we look out our windows the green grass has never looked better. My DH has finished using the chain saw and "pushing back nature". 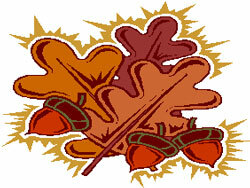 As is customary in autumn, leaves are floating downward. This fall they are falling from trees that have missing branches. Today my DH finished the first raking of our yard. Our fridge is being replenished. Much to my happy surprise my grocery store, Big Y, carries frozen green pepper pieces - ready to use. A bag of frozen blueberries was also in our grocery cart. I envision Blueberry Buttermilk Pancakes this weekend. There will be pancakes to add to our freezer! Electricity and Internet is back! Things are looking good! WooHoo!!! Now my DH and I know how dependent we are on electricity! The nor'easter slammed into Western MA and our power was out for 6 days. 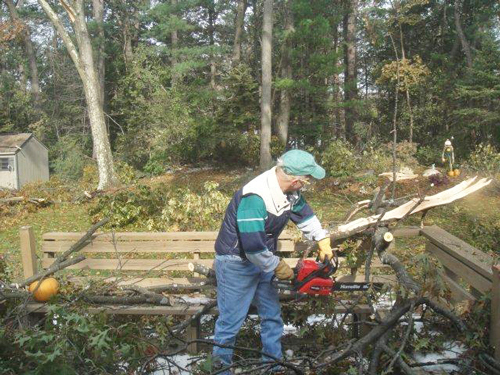 We are thankful for the hard working men/women from all over our country who are helping our state. 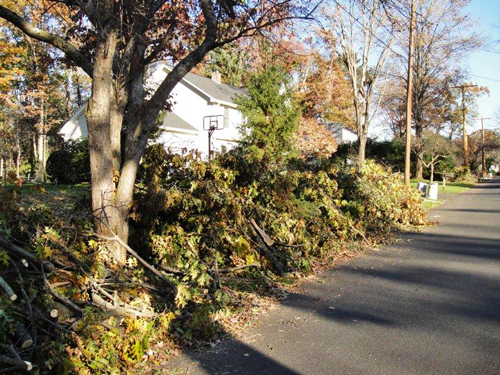 We have power back on our street! 11/8 - Update: Yesterday AM (11/7) our Internet + t.v. service was restored! My son and his gf welcomed us back to the 21st century and to the internet!